Many parents and teachers are taking advantage of the benefits of technology when it comes to teaching and entertaining children. In fact, many classrooms have incorporated computers into their daily routine. It makes sense. Technology rules! Not only can it help children’s learning processes, it can also begin equipping children with valuable skills they will need as they grow up. However, some studies have shown that there may be some unintended negative consequences that come with increased use of technology. Eye strain, decreased knowledge retention rates, and overdependence on technology are some of the issues that have come up. Of course, this is no reason to throw the baby out with the bathwater! 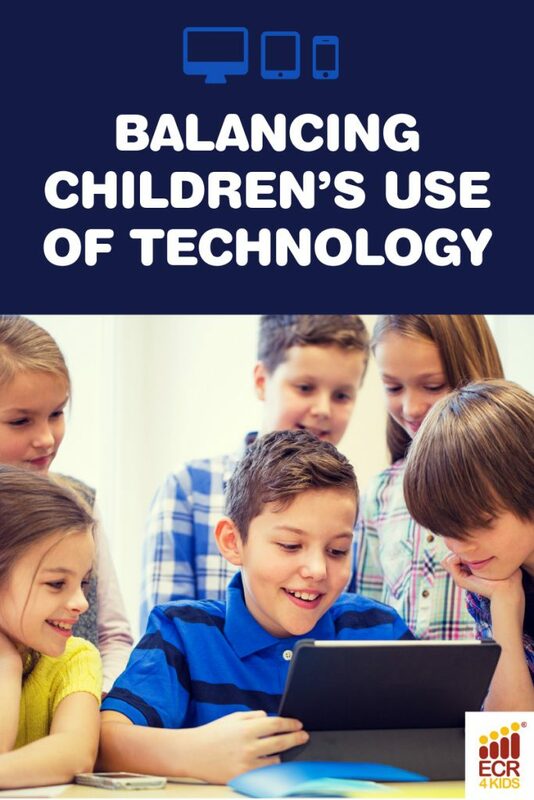 Many experts believe that the benefits of technology, when properly incorporated into children’s learning process, far outweigh possible negative side effects. Plus, these effects can be avoided by following some basic technology rules. Below you will find a few simple steps you can take to make the best of your children’s use of technology. Children’s eye health can benefit by following the 20-20-20 rule—in fact, this is a good tip for anyone who spends part of their day looking at a screen. Whenever we are looking at a screen, we tend to blink about half as much as we would otherwise, and the goal of the 20-20-20 rule is to prevent the resulting uncomfortable dryness and blurry vision. The rule states that to avoid dry, tired eyes, anyone looking at a screen should take a break every 20 minutes, for at least 20 seconds, and look at objects that are 20 feet away. Incorporating this rule can help children develop better computer habits and prevent blurry vision, fatigue, and eye strain. The 20-20-20 rule is not the only rule you can follow. There are other ways you can avoid eye strain. For more information read “Computers, Digital Devices and Eye Strain” by the American Academy of Ophthalmology. We all know that a child sitting in front of a television is likely not learning much. That’s because the experience of watching TV tends to be a very passive one and children learn through interaction. Tablets and computers are a great deal more interactive than a television; however, if the games and activities they’re using on them are designed as facilitators, the lessons are less likely to be engaging or effective. Many apps and games are designed just to teach. This means that, despite their best intentions, these activities can lead to a more passive and ineffective learning experience for children. In order to avoid providing children with a passive experience, look for activities that give children the opportunity to create and explore. The goal is to fuel children’s curiosity, problem solving and independent thinking skills. They should be doing more than observing or memorizing. For suggestions on good educational apps for children, visit our post listing 24 challenging and Fun Educational Apps. According to experts, children require a combination of crucial emotional, social, cognitive, or physical experiences. This means that children cannot gain everything they need through the use of technology. This is quite clear. The trick, however, comes in teaching children how to use technology to enhance their social interactions rather than to replace or avoid them. You can do so by making sure that using technology isn’t akin to “alone time.” Look for games and activities that require collaboration. Encourage your children to use technology to communicate with others. Consider asking them to find a way to communicate an idea, emotion, or lesson by using technology. Ask them to teach you something by using the devices and programs you use to teach them. This will help them see the way technology can be used to interacts with others rather than avoid them. How do you use technology to teach? Share your best practices in the comments below. And don’t forget to “like” ECR4Kids on Facebook! We have all kinds of fun learning ideas, promotions, and interesting articles.